Fresh corn polenta paired with fried eggs is the perfect summer breakfast or lunch. The texture is identical to polenta but tastes so much more flavorful. Let’s talk about polenta, and not the stuff from the box but polenta made with fresh corn! I recently discovered this recipe while browsing through Taste and Techniques by Chef Naomi Pomeroy which has become one of my go to cookbooks when I need to look for the best technique to prep or cook a dish. Fresh corn polenta is made straight from the cob. Ears of sweet summer corn are grated using a box grater to capture all the juices and starches to help emulsify the kernels. Grating fresh corn does require a bit of elbow grease but the result in incredibly delicious. The texture is identical to polenta but tastes so much more flavorful. I added in a bit of mascarpone for a little creaminess but you can also add in any cheeses and herbs you fancy. To make it a complete meal, a fried egg is served along the fresh corn polenta but you can pair it with tomato confit, roasted veggies, or a protein of choice. This fresh corn polenta is so good that I have been making it weekly and will make it for the rest of the summer while fresh corns are in season. 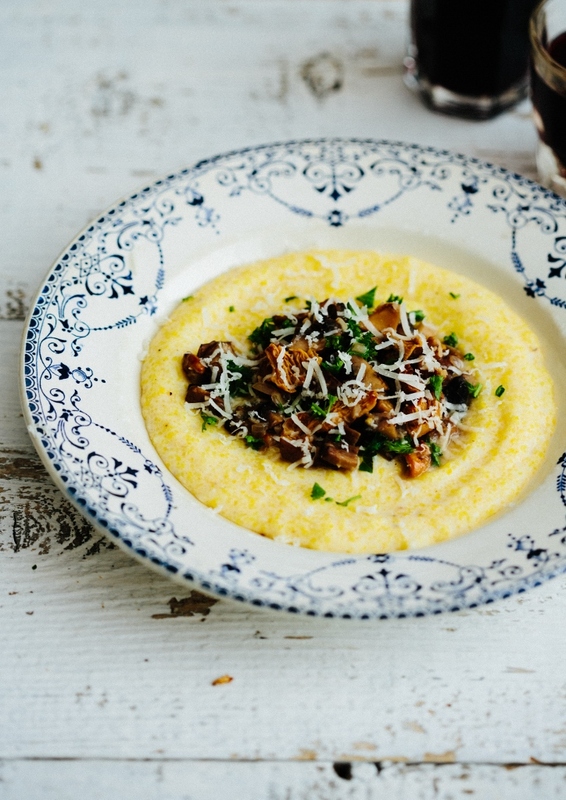 If you like polenta, check out this recipe: truffled polenta with mushroom ragu. Fresh corn polenta is made with grated fresh corns. The texture is identical to polenta but tastes so much more flavorful. Put two pieces of parchment paper on a baking sheet. Shuck the corn and remove any silk. Snap each ear in half. Use the largest holes of a box grater, grate the corn to the cob over the parchment to capture all of the kernels and corn juices. Carefully lift the paper and pour everything into a bowl. Over medium-low heat, in a saucepan, add the butter. Add the corn and its juices, the salt, and the pepper and cook, stirring constantly, about 10 minutes. Don’t add any liquid unless you really have to, but if the corn sticks and looks very dry, add 1 tablespoon of water. Stir and taste often until no liquid is left and none of the corn tastes raw. Turn off the heat and stir in the mascarpone. Divide the corn among four plates. Heat nonstick sauté pan over medium-high heat. Add olive oil and heat until the surface is rippling slightly but not smoking. Crack the egg into the hot pool of oil. If the oil is hot enough, the white should spread only a little. Use a spoon to quickly baste the hot oil onto the egg white, being careful to avoid the yolk. Continue spooning the hot oil onto the white until the white is almost set, about 45 seconds. When the white is opaque, use a spatula to transfer the egg directly on top of the polenta. Repeat with the remaining eggs, adding more olive oil as necessary, then garnish each plate with chives, additional salt and pepper to taste, and serve immediately. This rhubarb polenta cake has a delicious tartness that shines against the moist, pleasantly crumbly, and grainy texture of polenta. How is it that it’s June already?!! May was an intense month for me with photography project deadlines, being on our local TV channel (I’ll share more in another post), and traveling to the Bay Area for a friend’s wedding. Work and traveling left me mentally exhausted so I took some time off to recharge. I’m back and excited to post my first recipe for June, a rhubarb polenta cake that I have been waiting for two years to share. Yes, you read that right! TWO years! Two years ago I grew rhubarb from seeds and they flourished and survived the blazing summer heat of San Diego. Thank you garden god! We couldn’t eat them fast enough. They went into many crumbles, pies, cakes, and ice cream. Then came baby Dillon, a period of adjustment to life with a toddler and a baby (still adjusting by the way), and a hiatus from blogging. I didn’t want another year to go by and not share this recipe with you. This rhubarb polenta cake is a family favorite. It’s a simple cake that heralds spring. The tartness of rhubarb shines against the moist, pleasantly crumbly, and grainy texture of polenta. Vu is all about chocolate cakes but this particular one he loves, especially warm from the oven with vanilla ice cream. It’s such a cliche but we enjoy a lot of our baked goods with vanilla ice cream. If there’s any leftovers, I reheat it the next day for a minute in the oven and enjoy it with a cup of tea. I do have to warn you that this rhubarb polenta cake is not for the faint of heart. The tartness of rhubarb does scare some people. If you’re not keen on rhubarb, you can always replace half of the rhubarb with strawberries and it will be as delicious. When I bring it to work, there are two camps–people who grew up with rhubarb and have fond memories of something their grandmas and moms made and will demolish this in seconds. But the other group doesn’t want to to eat a veggie cake. Rhubarb is a vegetable after all. If you like rhubarb and polenta, this cake is for you! This rhubarb polenta cake is a simple cake that heralds spring. The tartness of rhubarb shines against the moist, pleasantly crumbly, and grainy texture of polenta. In a mixing bowl, whisk together flour, polenta, baking powder, baking soda, and salt. Set aside. Trim rhubarb into batons to fit the pan. Cut any thick stems in half along the length. Grease a 9 inch round cake pan or spring form pan. In a stand mixer, fitted with the paddle attachment, cream the butter and sugar together until pale and fluffy. Add the egg, vanilla, and lemon zest and beat until well combined. Add half the milk and half the flour mixture and beat until well combined, scraping down the sides as needed to incorporate any chunks. Repeat with the remaining milk and flour mixture. Scrape the mixture into the prepared cake pan, smooth the top with a palette knife. Place the rhubarb batons on top. Place the cake in the oven in the middle rack and bake for 30 minutes. Remove the cake from the oven, sprinkle the sliced almonds around the edges and turbinado sugar on top. Bake in the oven for an additional 20-25 minutes until a toothpick inserted in the middle comes out clean. Remove the cake from the oven and allow to cool for 15 minutes. Dust the cake with confectioners's sugar and serve immediately with vanilla ice cream. The cake will keep in an airtight container in the refrigerator for up to two days. Mushroom was not a part of my culinary repertoire until we lived in Washington and our friends introduced us to most amazing varieties. Every fall they would trek to Olympic National Forest and hunt for golden chanterelles and lobster mushrooms deep in the forest, turning over salal and fern to look for these treasures on the forest floor. When the mushroom crop was good, we were gifted with pounds of chanterelles. I’m smitten with the chanterelle because of its lovely peach-like fragrant, golden color, and meaty texture. I love turning chanterelles and other mushrooms into a ragu to pair with a bowl of polenta. This dish is one of our favorite fall comfort foods especially for those nights when we want a hearty vegetarian meal. 1. To make the mushroom ragu, heat oil oil and butter in a heavy-bottomed skillet over medium heat for 30 seconds. 2. Add the shallots, garlic, and thyme and let everything cook until soft and fragrant, about 3 minutes. 3. Add the mushrooms and coat them in the butter and shallot mixture. Let them cook for about 10 minutes until their juices start release and evaporate. 4. When the mixture starts to dry up a bit, add in the white wine and creme fraiche and cook for another 15 minutes. 5. Season the mushroom ragu with salt and pepper to taste. 6. For the polenta, pour water in a heavy saucepan and bring to a boil over high heat. Reduce the heat to medium-low and slowly pour the polenta in the pan while gently whisking the mixture together. Stir the polenta occasionally with a wooden spoon while it’s gently simmering to prevent it from sticking to the bottom of the pan. 7. Add in the milk and continue cooking the polenta for another 30 minutes or until softened. If the mixture starts to dry out, add two tablespoons of water at a time to soften the mixture. 8. When the polenta is softened, stir in the shaved Parmesan cheese and truffle oil. Season with salt to taste. 9. 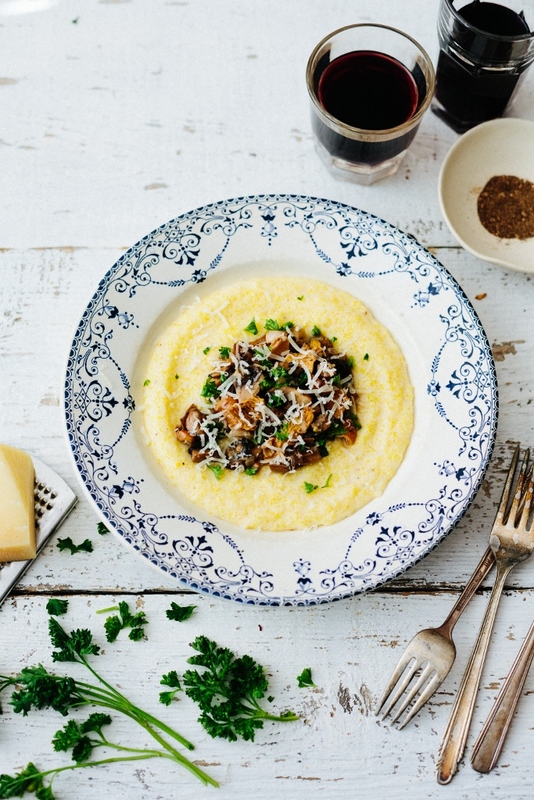 Divide the polenta between four bowls and top with mushroom ragu. Garnish with chopped parsley and additional Parmesan cheese if you like.